#1 Welcome to the Sunday edition of the weekly edit! I've always wanted to post one of these on Sunday because nothing really happens to me during on weekdays so the weekends are my highlights and when I have more interesting topics to share (besides this one, lol). Maybe I will start posting these spontaneously just to change things up a bit. 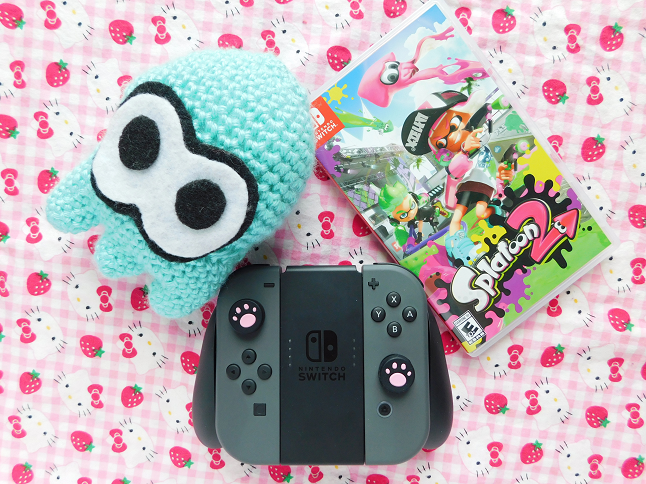 #2 If you haven't guessed already the reason why I didn't post on Friday was that I was playing Splatoon 2! No surprise there! You can expect a review on the game as soon as I finish playing the story mode which should be soon! #3 In case you were wondering where I got that Splatoon squid, well I made it! If you want to crochet one for yourself the pattern is in this post! #4 Can you believe there is only one more week left in August? Like I said in my August goals I wanted to have a closet cleanse but I haven't even started! I did clean out some of my drawers but still need to tackle the biggest task, the closet. Hopefully, I can get this done on Tuesday or Wednesday. #5 Two songs that have been stuck in my head are Gashina by Sunmi and Eye's On Me by Junoflo (feat. G.Soul and Dok2). Both have been on loop nonstop! Eye's On Me is from Show Me The Money 6 which is a Korean rapper competition program. I've actually never watched the show but always listen to the albums because some of the songs are amazing! #6 I hope you guys aren't annoyed with all the crochet posts I've been posting. I'm not sure whether you guys enjoy reading them or not but I do get more views when I post crochet related content but I would like to know what you guys prefer. #7 With autumn approaching I want to do something fun like a series or something. I was thinking about participating in Blogtober but I'm not sure if I will be able to post every day in October and then again in December for Blogmas (Yes, I will be doing that again this year!). If any of you have any suggestions as to what I could post in October similar to Blogtober or any type of posts you would like to see in autumn let me know. Whilst crochet isn't something that I know anything about, I love that you love it, and I love seeing what you create! Remember that your blog is for you, and you should always post something if it makes you happy. The right audience will find you. I don't even know what Splatoon is but that squid is too cute!! !